On November 9-11, over 5000 Quakers descended on campus to celebrate the 10th Anniversary of Homecoming Weekend Featuring Arts and Culture and the launch of Penn’s historic fundraising and engagement campaign. Events throughout the weekend gave alumni a glimpse of how Penn is Advancing Knowledge for Good here on campus and around the world. Alumni gathered in Irvine Auditorium for a special presentation featuring panelists Dr. Robert Vonderheide, Director of the Abramson Cancer Center, with pioneers in immunotherapy Drs. Carl June, David Porter, Noelle Frey, E. John Wherry and Avery Posey. 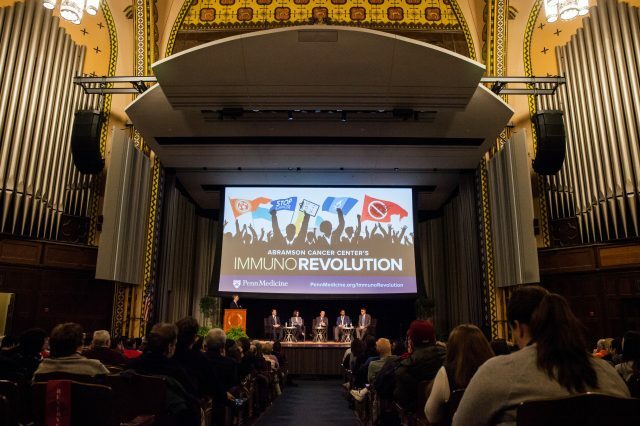 The discussion explored how Penn Medicine researchers are harnessing the body’s own immune system to fight cancer, and how the new Pavilion under construction at the Hospital of the University of Pennsylvania will advance patient-centered healthcare as part of the University’s goal to Revolutionize Health through The Power of Penn Campaign. PennDesign brought experts together to discuss how landscape architects are Driving Energy Solutions by taking new approaches to urban and environmental design in the face of global climate change. The event was held in anticipation of the upcoming Design with Nature Now conference and exhibition, which will mark the 50th anniversary of Ian McHarg’s 1969 book, Design with Nature. McHarg, who founded Penn’s department of landscape architecture, pioneered the concept of ecological planning. A panel celebrating the 10th Anniversary of Homecoming Weekend Featuring Arts and Culture was hosted by Director Lynn Marsden-Atlass at the Arthur Ross Gallery. 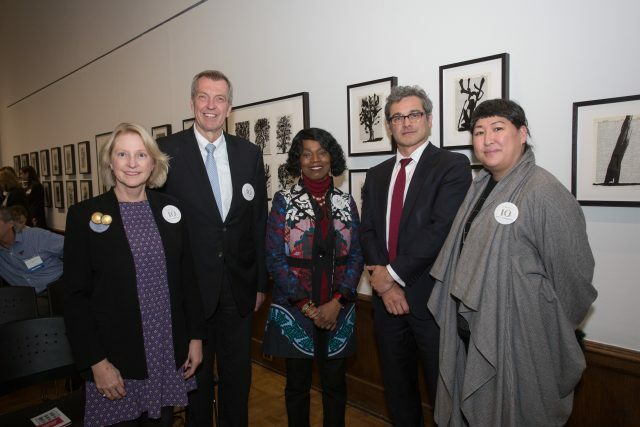 Leaders present included Amy Sadao, the Daniel W. Dietrich, II Director of the Institute of Contemporary Art; Julian Siggers, the Williams Director of the Penn Museum; and Paul W. Meyer, the F. Otto Haas Executive Director of the Morris Arboretum. These creative cultural leaders at Penn discussed the Campaign as an unprecedented opportunity to highlight and support the arts across the University—and how to make Penn’s arts resources more accessible to the community and the world. The Penn Museum’s Building Transformation project will bring the University’s unparalleled collections into the light, and digitization as well as transformed galleries will allow more people than ever to experience all that the institution has to offer. As part of the University’s efforts to Advance Knowledge Across Disciplines, arts education will be ever more integrated into the curriculum and other aspects of campus life. The Graduate School of Education hosted a conversation with the presidents of Widener University, Tarrant County College, Whittier College, and the Community College of Philadelphia, along with Penn Provost Wendell Pritchett. Moderated by James S. Riepe Professor Laura Perna, the panel discussed the biggest challenges facing higher education, plans for the future of their institutions, and efforts to Expand Student Opportunities on campus and beyond. University architects led registrants on a tour of Penn’s newest additions, including the Perry World House, the Levin Building, New College House and more. Alumni learned how new construction will Incubate Innovation and Entrepreneurship through dedicated buildings and design meant to encourage collaboration. The weekend was headlined by The Power of Penn Palooza, a University-wide extravaganza on College Green featuring a special welcome by Penn President Amy Gutmann and musical performances by Kenn Kweder, Kayvon, and Bloodpop©. Aligning with the University’s commitment to Engage Penn Alumni, the weekend also focused on introducing current students to the traditions that will keep them connected to Penn after they graduate. This year, students from the Class of 2018 helped the Class of 1968 bury their time capsule at the Quakerfest Tailgate, and students from the Class of 2022 planted their class tree. Homecoming Weekend Featuring Arts & Culture is just one of many opportunities to re-engage with Penn. Visit our Get Involved page to learn more about how you can engage by participating in The Power of Penn Campaign through attending an event, making a gift, or volunteering your time. Despite the brisk day on College Green, attendees kept cozy in their Red and Blue! Members of the Class of 2022 plant their tree. The time capsule for the Class of '62 is buried. The Power of Penn Palooza continued well into the evening.